Dalyan. Don’t feed the turtles, do eat the cake. A post by Bohemian Travellers prompted me to reflect on the recent trip I made with my family to Dalyan. This was the fifth time I had visited Dalyan and doubt that it will be the last. What, the whole world out there and you go to the same place five times, I hear you say? Yup. I used to think that going to the same place over and over again was dull and boring too. It’s not. I am not going to make an apology for this, for here’s the thing, Dalyan does that to you. It calls to you and soothes you. Going to Dalyan is like going home. There are a lot of British people who have made Dalyan their home. One quite famous one, but I will come back to that. And this year I didn’t meet one British holidaymaker for whom this was a first visit. Yet it has not been transformed into a resort where you can get English Beer for breakfast. Dalyan has hardly changed in the 9 years I have been going. Indeed, A Proper Holiday was first published in 1996, yet if you read it now you would still recognise that Dalyan is the fictional Karput. If you go, add this to your reading list. The other main European tourists are Dutch, and Dalyan is increasingly a destination for Turks escaping Turkish city life. When you get off your plane in Dalaman, don’t worry, those fellow passengers with names on the back of their t shirts will be heading off to Marmaris or Ichlemer. Not Dalyan. Audible sigh of relief. The last three times I have been, my party have been the only ones heading to Dalyan. That is not to say that Dalyan is dull or only for the middle aged hiker, retired couples, or families, it is for everyone. It is just not party central. It is for travellers and tourists who want to experience Turkish life. Bars will gear up for the football matches but there is no rowdiness, Turkey just loves football. There are cocktail bars, swish restaurants, cafes, 5 star hotels, 2 star hotels and even a camp site. There is a fantastic market every Saturday with everything from genuine fake watches to fresh fruit and vegetables. My number one tip about the market is check out the jeans. The quality is amazing. Number two tip is haggle. Yet Dalyan is all about the river. This is where it all happens. If you want a day out, go to the river as there are hundreds of boats to take you to Koycegiz Market, the mud baths, Sultaniye and Iztuzu (Turtle Beach). Or take a rowing boat to visit Kaunos. Some scenes for The African Queen were filmed in the reed beds of the river. So what is the deal about feeding turtles? Remember that famous person I mentioned? Meet Kaptan June. She is the reason Dalyan has remained unspoilt. 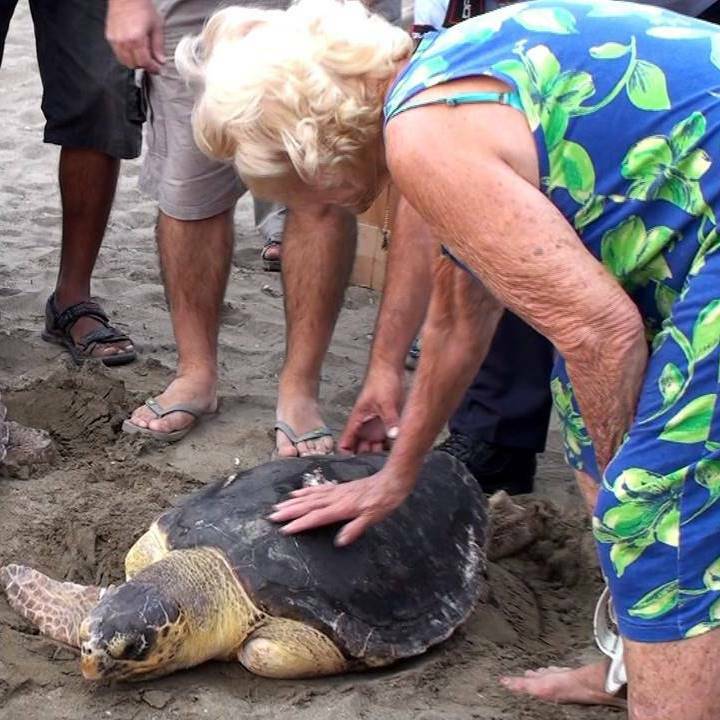 In her fight to protect the turtles that lay eggs on Iztuzu beach, she with a little help from David Bellamy successfully stopped any building on or near the beach. The turtles now have a new threat as increasingly tours to feed the turtles are being advertised (shame on any holiday firms that offer such trips). The boat will stop and lure in turtles to eat chicken. Chicken is not the natural diet for a turtle. And the turtles are also coming from the sea to the fresh water of the river to be fed, which is also not a good thing. We all love to see the turtles as that is what Dalyan is famous for, so instead of taking a trip to feed the turtles, get a dolmus to take you to Iztuzu and visit the sanctury where you will see turtles and learn about the dangers that they face then go tell everyone you meet in Dalyan not to feed the turtles! And the cake? Go eat cake at Dalyan Iz. 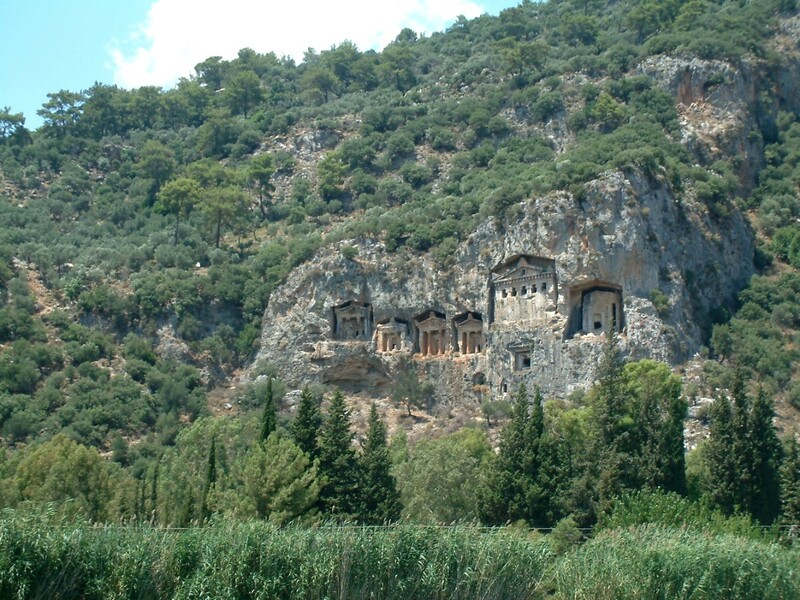 If you want to find out more about what to do and see and eat in Dalyan, please contact me. If you have been to Dalyan I would love to hear from you. This entry was posted in Dalyan, Travel, Turkey and tagged Dalaman, Dalyan, David Bellamy, Kaunos, Marmaris, Sultaniye, Turkey, İztuzu Beach by Travelling Coral. Bookmark the permalink.